Geodynamics research in SG&T is focused on understanding the forces that drive deformation and tectonism in the solid Earth, and the role that rock rheology, physical state (solid or partially molten), and composition play in controlling such deformation. 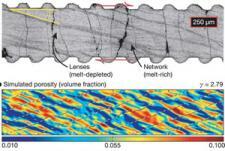 The techniques include computational and laboratory studies of deformation and melt migration, and the application of observational geodetic and seismic techniques to probe these processes at the field scale. SG&T's geodynamicists collaborate closely with colleagues in Deep Earth Structure and Earthquake Faulting, as well as geodynamics researchers in Lamont's MG&G and Geochemistry divisions.